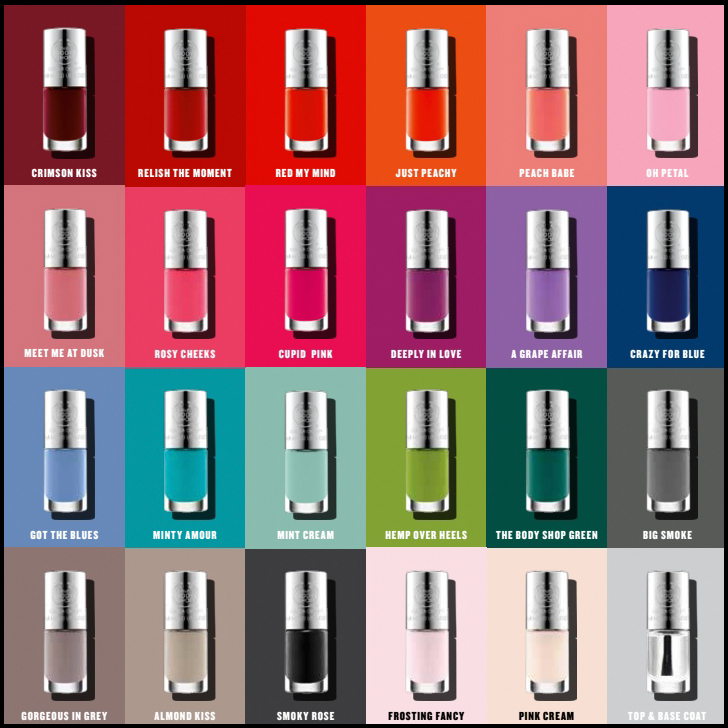 The Body Shop Color Crush Nails Collection - with swatches! The Body Shop Color Crush Nails - $6 - in 24 shades: Crimson Kiss, Relish The Moment, Red My Mind, Just Peachy, Peach Babe, Oh Petal, Meet Me At Dusk, Rosy Cheeks, Cupid Pink, Deeply In Love, A Grape Affair, Crazy For Blue, Got The Blues, Minty Amour, Mint Cream, Hemp Over Heels, The Body Shop Green, Big Smoke, Gorgeous In Grey, Almond Kiss, Smoky Rose, Frosting Fancy, Pink Cream, Top & Base Coat - that were inspired by nature with a formula free of harsh chemicals and enriched with Community Fair Trade marula oil for a quick-drying, high gloss finish. The formula is nice and creamy, applies easily and covers in 2 coats - although you might need 3 coats in some spots with the light shades.